There are many minorities in present-day Cambodia, with their own languages, written or non-written. Those that have a writing tradition, e.g. Chinese, Vietnamese, Cham and Lao, have, for that very reason, attracted most of the attention of historians. But those that do not have a written tradition used to be relegated by historians to a kind of mythical limbo: no written documents, therefore no history. Nowadays, historical sciences have considerably expanded their views and their methods. In this talk, we will look at the historical linguistics of these unwritten languages, and their possible contribution to the ancient history in Cambodia. Three groups of languages will be examined: the Kuay, the Pearic and the Bahnaric, each with their own present situations and their distinct histories. From such studies, we sometimes get glimpses of ancient history that reach much further back in time than what the Pre-Angkorian texts written in Old Khmer may offer to us. June 28th 2013, at 6:30 pm at the EFEO. L'objet de la conférence est de resituer cette affaire dans le contexte historique des relations franco-siamoises d'abord, dans le rappel du premier conflit avec la Thaïlande et de son règlement devant la Cour Internationale de Justice en 1962 ensuite et, enfin, d'expliquer le second conflit avec les procédures écrites et orales qui ont suivi la requête en interprétation de l'Arrêt de 1962 introduite par le Cambodge le 28 avril 2011. 6.30 p.m., monday 6 May 2013 at the EFEO Centre. The présentation is in French. The Graeco-Roman Silk Road. The Mediterranean perception and relations with the Eastern and Southeastern Asia. The term Silk Road was introduced by German explorer Ferdinand von Richthofen to describe a vast mesh of trade routes connecting Europe, Asia and Africa in the ancient times. The Maritime Silk Road which linked Southeast Asia with China, India and Europe was one of the routes parallel to the most common land route developed in the last centuries BC. This sea route started at one of the ports, along the Red Sea coast in Egypt, which was under the Roman rule since 30 B.C. from where the merchants travelled east to the centres of trade in India. At the same time the trade vessels, taking advantage of the monsoon winds sailed across the Bengal Bay to reach Southeast Asian markets, rich in local products and imports from China. The route linked four different regions: Mediterranean, India, Southeast Asia and China. The relations between these regions left many traces known from archaeological and historical sources. During the presentation I would like to show results of our research, focusing on Graeco-Roman written sources on Eastern and Southeastern Asia, especially the Periplius of the Erythrean Sea and the works of Pomponius Mela and Claudius Ptolemy. Other issues that I would like to discuss ae the preliminary results of Sino-Polish research project focusing on trade and cultural contacts in Tarim Basin with the Mediterranean world and the Empires of Han (China) and Kushan (Central Asia, Northern India). March 6th 2013, at 6:30 pm at the EFEO. Presentation will be in French. In the area around Angkor, a series of ceramic kilns dating from the 9th to 14th century have been discovered since 1995. The technical, typological and compositional characterization of their productions was one of the main goals of the Cerangkor project. Since the beginning of this project in 2008, more than 300 samples of Khmer stoneware produced in the Angkor region have been analysed chemically by XRF-WDS, 60 also petrographically. The studied ceramics comprise green-glazed stoneware, called Kulen type, and nonglazed stoneware of five kiln sites (Anlong Thom, Sor Sei, Tani, Khnar Po and Bakaong), as well as brown-glazed stoneware from the area of Teap Chey. The results obtained for the different types of ceramics produced at each workshop are to be presented. The data indicate that some workshops use quite similar raw materials for the same type of ceramics, independently of the workshop, suggesting the exploitation of the same geological formations for the whole region. Differentiation of the compositional groups characterizing each workshop proved therefore fairly difficult, but little differences allow distinguishing between some groups of workshops. However, as first analytical results for ceramics produced in other regions of Cambodia show rather different compositions, the database for the Angkor region presented here provides a very good basis for future provenance studies. February 6th 2013, at 6:30 pm at the EFEO. Asian monsoon variability from tree ring proxy records - recent progress and other applications. The first decade of the 21st century has seen significant development in the production of paleo proxies for the Asian monsoon, exemplified by the Monsoon Asian Drought Atlas that was comprised of more than 300 tree ring chronologies. Noteworthy among them is the Vietnamese cypress tree-ring record which reveals that the two worst droughts of the past 7 centuries, each more than a decade in length, coincided with the demise of the Khmer civilization at Angkor in the early 15th century CE. The 18th century was nearly as tumultuous a period across Southeast Asia, where several polities fell against a backdrop of epic decadal-scale droughts. At this time all of the region's charter states saw rapid realignment in the face of drought, famine and a raft of related and unrelated social issues. Several other droughts, some more extreme but of lesser duration, punctuate the past millennium, but appear to have had little societal impact. We have recently added the first pan-Asian reconstruction of temperature from an updated tree ring network but only for the temperate zone, and stable isotope time series from Vietnam and Cambodia. This increasingly nuanced paleo perspective can assist our analyses of the role of climate extremes in the collapse or disruption of regional societies, a subject of increasing concern given the uncertainties surrounding projections for future climate across the highly populated areas of Asia. Other applications of tree ring methodologies to subjects as diverse as archaeology and food security in Cambodia and elsewhere are also explored. January 15th 2013, at 6 pm at the EFEO. The talk briefly introduces the geology of Cambodia, with specific attention to those lithotypes exploited during the Khmer empire for building and sculptural purposes. A review of the existing information of the stone used for the sculptural production of different styles is presented, as well as the possible provenance of some of them, based on petrographic and geochemical data. February 15th 2011, at 6:30 pm at the EFEO. The Oc Eo archaeological site complex: An early Khmer city in the Mekong Delta ? Analysis of data collected during a Franco-Vietnamese archaeological research project (Mission Archéologie du delta du Mékong,1996-2002 )and during earlier work by French and Vietnamese archaeologists now indicate that the urban site of Oc Eo and the complex canal system centered on the site were in operation between the 2nd and the 4th centuries CE. Such earlier dates, and the fact that the site must be interpreted as an early Khmer settlement, forces one to reconsider the early history of Funan, a polity which now appears to have been "indianised" before "Indianisation". Member of EFEO, Dr. Pierre-Yves Manguin is an historian and an archaeologist, specialist of maritime history of Southeast Asia. Professor at the EPHE (Paris), he teaches "History and archaeology of the coastal States of Southeast Asia" and is responsible of the EFEO research team on "Exchanges, States formations and Urbanism in Southeast Asia", a subject on which he has been working on during many years. Dr. Manguin is also the director of the archaeological Mission of the Mekong Delta (Oc Eo/Ba Thê) with the Social and Human Sciences Institute of Vietnam in Hô Chi Minh City. Following the mission he conducted from 1989 to 1996 at Sriwijaya, he started recently with M. Soeroso another archaeological mission in Indonesia, on the Musi basin in South Sumatra, on the first large State during the 7th century. Wednesday, November 25, 2009, at 6:30 pm at the EFEO. sponsored by the Friends of the Freer and Sackler Smithsonian Institution, have been organized at the EFEO conference room on the occasion of the visit in Siem Reap of the Friends of the Freer and Sackler Galleries. "The Angkorian Road Network: A Study by the Living Angkor Road Project"
Initiated Jean-Baptiste Chevance in 2007 and entirely funded by private donors, the Phnom Kulen Archaeological Program aims to refine the different occupations of the Phnom Kulen, to promote the training of young Cambodian specialists, particularly archaeologists from RUFA, and to contribute to the development of the local communities, through health, education and infrastructures assistance. The Phnom Kulen is a unique topographic feature in the Angkorian landscape, dotted with numerous archaeological, architectural, rupestral and hydraulic remains. Many studied epigraphic references to the Phnom Kulen which attest of its importance in the Khmer history, however very little field studies had been undertaken. The Phnom Kulen Archaeological Program intends to conduct global archaeological field studies including prospections, surveys, excavations and conservation. The program is undertaken in close collaboration with the APSARA National Authority and is linked to numerous other archaeological teams working in Angkor. The talk will begin with the projection of a recent documentary about the Phnom Kulen Archaeological Program, followed by a brief presentation on the results of the 2008 and 2009 archaeological campaigns. Jean-Baptiste Chevance graduated from l'Ecole du Louvre in 1997 and completed his Master at the University La Sorbonne in Paris on architecture and decoration of the Phnom Kulen temples. He is currently a PhD candidate at the same university. He has been working in Angkor since 1999 as an archaeologist for the EFEO, for the FSP Program and for the preventive archaeological unit at the APSARA Authority. Besides, he worked intensively for INRAP in France. He designed the Phnom Kulen Archeological Program in 2007 and has been managing it since. Le site de Nong Hua Thong (province de Savannakhet), qu'Henri Parmentier visite rapidement en 1912 fut totalement oublié jusqu'en 2008, date à laquelle un trésor d'orfèvrerie d'origine khmère, d'une richesse exceptionnelle, y a été découvert. Trois courtes inscriptions khmères sont inscrites sur deux plateaux et un bol en argent. La plus ancienne peut être datée du viiie siècle. Ce « trésor » est actuellement en cours d'étude. Le site est caractérisé par une série de levées de terre dont certaines ont pu avoir fonction d'enceinte et par une série de retenues d'eaux. Les fouilles préliminaires qui ont eu lieu en avril 2009 (EFEO-Ministère de l'Information et de la Culture laotien), ont permis de constater une longue période d'occupation du lieu, remontant jusqu'aux époques protohistoriques. Historienne de l'art et archéologue, Christine Hawixbrock s'est spécialisée particulièrement sur le monde khmer par le biais de l'étude des monuments de Jayavarman VII, qui l'a conduite à la rédaction d'un doctorat en histoire de l'art et en archéologie khmère intitulée « Population divine, religion et politique sous Jayavarman VII » soutenu en 1994. Membre de l'EFEO de 1995 à 2002, Christine Hawixbrock a eu notamment, à Siem Reap, la responsabilité de la mission EFEO/Unesco de restructuration des collections des dépôts de la Conservation d'Angkor. Elle a participé à de nombreux programmes archéologiques, au Preah Khan et au Palais Royal à Angkor, à Muang Champassi et à Phanom Van dans le Nord-Est de la Thaïlande, et sur le site de Vat Phu dans le Sud-Laos. Christine Hawixbrock est actuellement chargée par l'EFEO et le ministère de l'Information et de la culture Lao des fouilles du site de Nong Hua Thong et de l'inventaire des pièces d'orfèvrerie du trésor de Nong Hua Thong. 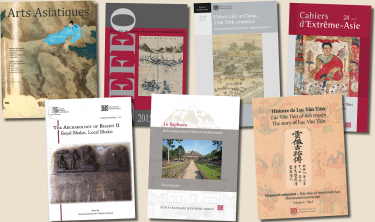 Elle est par ailleurs chargée par le SAGV (Service de l'aménagement et de la gestion du site du Patrimoine Mondial de Vat Phu, Champassak) de l'inventaire et du rangement des collections archéologiques du site de Vat Phu. Friday, September 25, 2009, at 6:30 pm at the EFEO. During the last four years, the Ceramic Team of the Department Conservation of Monuments and Preventive Archaeology of APSARA Authority, conducted archaeological studies, including mapping, excavation and analysis of the artefacts at Thnal Mrech Kilns (TMK) and Bangkong Kilns (BK). The radiometric datings obtained from various charcoal samples collected from these sites, suggest dates ranging from the 9th to the early 13thcenturies. The artefacts collected from the crossdraft kiln structures of TMK site and BK15 and BK16 have been classified according to Khmer linguistic terms for ceramics, defined by both shape and function, such as Kpoeurng (roof tile), Danlap, Kotth, Khuoch, Ak kambor, and Chan (small containers), Tho, Ka-am, Chhnang, Krala, Phoeng and Peang (large containers). This presentation is divided into two study cases. In the first one, we have examined pottery technology: the physical and characteristics of clay and temper and the art of decorated ceramic vessels in clay. In the final one, we have explored the standardization hypothesis. We use measurement of standardization in ceramic as evidence for specialized craft production. The analysis and interpretation of ceramic wasters remains at both kiln sites in Angkor region, allows archaeologists to accomplish varied results. These include establishing a time scale, documenting interconnections between different areas, and suggesting activities that were carried out at particular sites. These techniques and theories are used to bridge the gap between the recovery of ceramics and their interpretation within archaeological contexts. Chhay Rachna graduated a B.A. degree in Archaeology from the Royal University of Fine Arts in 2002. He wrote his dissertation on Kbal Spean, Ancient Stone artefacts. Since 2003, he worked for the Conservation of Monuments in the Angkor Park and Preventive Archaeology Department of APSARA Authority. He had been involved in various cooperation projects between APSARA with NRICP, GAP, EFEO, and NUS. From 2006, his team conducted the excavation and analyst the artifacts from Thnal Mrech Kilns Site and Bangkong Kilns Site in the Angkor region. Heng Piphal is a Ph.D. candidate at the Department of Anthropology, University of Hawai`i at Manoa. He received his B.A. from the Faculty of Archaeology, Royal University of Fine Arts, Phnom Penh in 2002. Heng Piphal has been involved in many professional archaeological projects with American teams (LOMAP, University of Hawai'i, Heritage Watch, and NAGA), Japanese teams (JSA and SCP), German teams (Memot Center of Archaeology), and local Cambodian institutions (APSARA, the Ministry of Culture, and the Royal Academy of Cambodia). His works cover Cambodiaprehistory to pre-Angkor and Angkor periods. His main interests, however, is a political economy approach to early state formation in Cambodia. Tuesday, June 30, 2009, at 6:30 pm at the EFEO. Partie 3 : Evolution ou révolution culturelle à Hariharâlaya? Located in the area of Roluos, the capital of Hariharâlaya and some of its monumental temples constitute the first Angkorian capital, a prototype strongly influential on town planning studies and historical research in Angkor. Three successive talks, one week apart, will present the outcomes of some recent works carried out in Roluos, mostly within the framework of the French-Cambodian archaeological mission for the Angkor region (APSARA / MAE / EFEO). The third talk (13th March) given by Armand Desbat (in French) has introduced the studies undertaken on the ceramics unearthed during the archaeological excavations in Roluos. He will present some preliminary results and various research perspectives on the evolution of the angkorian ceramic culture and its influences. Armand Desbat, Directeur de Recherches at CNRS in Lyon, is a ceramologist with a long experience in ancient ceramics in Europe. Since 2004, he has been studying angkorian ceramic corpus, at the airport rescue excavations and in Roluos. Part 1: Dating temples: histories of styles & style of history? Located in the area of Roluos, the capital of Hariharâlaya and some of its monumental temples constitute the first Angkorian capital, a prototype strongly influential on town planning studies and historical research in Angkor. Two successive talks, one week apart, will present the outcomes of some recent works carried out in Roluos, mostly within the framework of the French-Cambodian archaeological mission for the Angkor region (APSARA / MAE / EFEO). In the first talk (27th February), Christophe Pottier has presented in English how architectural studies of some of the best "well dated" monuments, Prah Ko and Bakong, show an unexpected chronological complexity and the need for an in-depth reappraisal of the understanding and chronology of the first Angkorian monuments. Part 2: Beyond temples: a new picture of de Hariharâlaya? The second talk (6th March) has been given jointly by Annie Bolle and Christophe Pottier (in French). It has introduced the archaeological excavations investigations conducted in Roluos in four different sites (Prah Ko, Bakong, Prei Monti and Trapeang Phong) and how it helps to draw a new and integrated picture of the capital of Hariharâlaya. Beyond the case of Hariharâlaya, it is thus a new reading of the beginnings of the urban history of Angkor which will be proposed. Dr. Christophe Pottier is the Director of the EFEO center in Siem Reap since 1992 and he conducted some restoration works and various researches on Angkor architecture and territorial planning. Since 2000, he directs the French-Cambodian Archaeological Mission on the Angkor Region and is also co-director of the Greater Angkor Project. Annie Bolle, archaeologist at INRAP (Institut national de recherches archéologiques préventives - France) has been excavating in Angkor since 1995, and in Roluos in particular since 2004. 27th February 2009 at 6:30 pm at the EFEO. The Sacred Complex of Preah Vihear will be presented on the basis of field-work done at the site from August to December 2008. Five inscriptions relating to the site will be discussed in an attempt to adress a number of unsolved questions regarding the chronology, layout and significance of the site. As founder of the Southeast Asian Review, Sahai has edited and published thirty two volumes of this journal since 1976. In 1981, he founded the international conference on Thai Studies. Sahai held the Chair of Southeast Asian Studies at the Magadh Universty , Bodh Gaya (India) and worked as the Pro Vice Chancellor of the university in 2001. He has also worked as Fellow, Indian Institute of Advanced Study, Shimla (2003-2006); Research Professor at Indira Gandhi National Center for the Arts, New Delhi (1988-90); and Visiting Professor of Asian Civilization at Sisavangvong University, Vientiane (1970-73). Sahai is currently Expert-Historian Apsara Authority, Siem Reap. 6th February 2009 at 6:30 pm at the EFEO. The conference on Dynamics of Human Diversity in Mainland Southeast Asia organized by Nick J. Enfield (MPI Nijmegen) and Joyce C. White (University of Pennsylvania) has taken place at the Siem Reap Center from January 7 to 10. After Epigraphy (2009) and Archaeometallurgy (2011), the Siem Reap Conference on Special Topics in Khmer Studies (sr costiks) organised jointly by the APSARA, Ecole française d’Extrême-Orient, Center for Khmer Studies and University of Sydney. It takes place at the Apsara Authority buildings from 9th to 11th June 2012. We are pleased to announce that after Epigraphy (2009) and Archaeometallurgy (2011), the Siem Reap Conference on Special Topics in Khmer Studies (sr costiks) organised jointly by the APSARA, Ecole française d’Extrême-Orient, Center for Khmer Studies and University of Sydney with the help of the Friends of Khmer Culture, will be dedicated this year to History of Religions. It will take place at the Apsara Authority buildings from 9th to 11th June 2012. Public Lecture by Prof Roland Fletcher and Dr Christophe Pottier on "Re-viewing Angkor: a long journey"